Samsung has introduced the first Galaxy Note in September 2011 at the 2011 IFA (Internationale Funkausstellung) in Berlin, Germany, and there were mixed reaction about the (back then) huge device packing a 5.3-inch screen. There were also a lot of mixed reactions regarding the capacitive stylus the phone came with out of the box (which Samsung calls the S-Pen); it was an interesting move to bring back a smartphone pointing device after the original iPhone (announced in 2007) has basically killed the need for one, introducing a finger-friendly operating system with a capacitive touch-screen, instead of the resistive ones before that required a classic stylus in order to interact with the interface. As we’re getting closer to the 2014 IFA (beginning on September 5, 2014, in Berlin, Germany), companies are starting to send out official invites to press releases and special events. Other companies, like Samsung for instance, are publishing teasers. One such teaser is embedded below, and it refers to the next-generation Note device, most definitely called the Samsung Galaxy Note 4. IFA is where Samsung historically announces its Note phablets, and so far has maintained that custom (while moving away from MWC with the Galaxy S devices, and then this year returning to the Barcelona show). 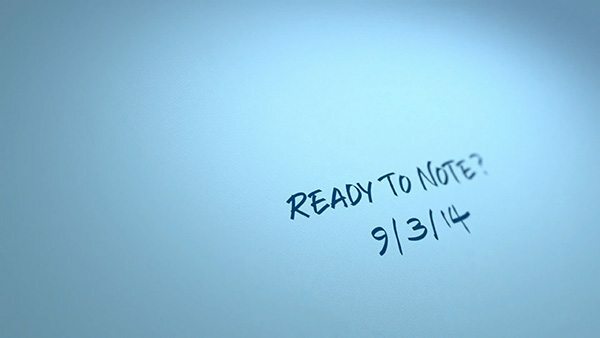 While the teaser below doesn’t specifically mention the Galaxy Note 4, it asks us whether we’re “ready to note”, on September 3, 2014. Samsung has a special event planned for that day, so we can draw our own conclusion (even more that last year’s IFA special Galaxy Note 3 event had the tagline “make note”). You won’t find clues to what’s coming, nor pictures or footage of the device. Instead, Samsung, in its own way, reminds us that it “re-invented” the stylus, bringing it to the users as part of the Galaxy Note experience. However, there’s room for speculation after watching the embedded video: since we’re talking about inventions and innovation, Samsung might be preparing something special for the Note 4. We’ve heard rumors in the past that were talking about a new form factor for the device, but there were no specifics. We will definitely find out more on September 3.